Because of the Enlightened Teacher Tonpa Sherap’s immeasurable compassion, there are teachings and methods of help available according to each individual’s ability and capacity. Included are methods of liberation using each of the five senses such as the well known “Liberation through Hearing” texts. Similarly, there are sacred things that are meant to be held or worn close to the body and liberate through touch. 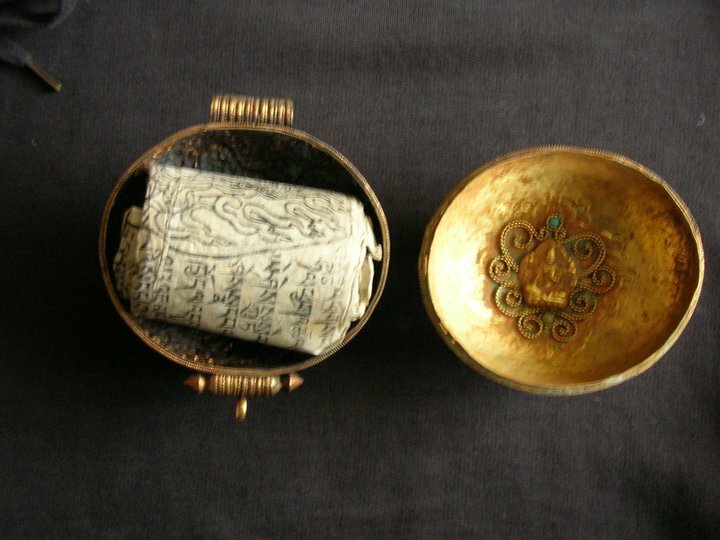 Often, mantras and texts such as these are carried on the body within a special container. Posted on October 31, 2014, in Prayer and Ritual, Tibetan Culture & History, Uncategorized and tagged religious texts, sacred, yungdrung bon. Bookmark the permalink. Leave a comment.